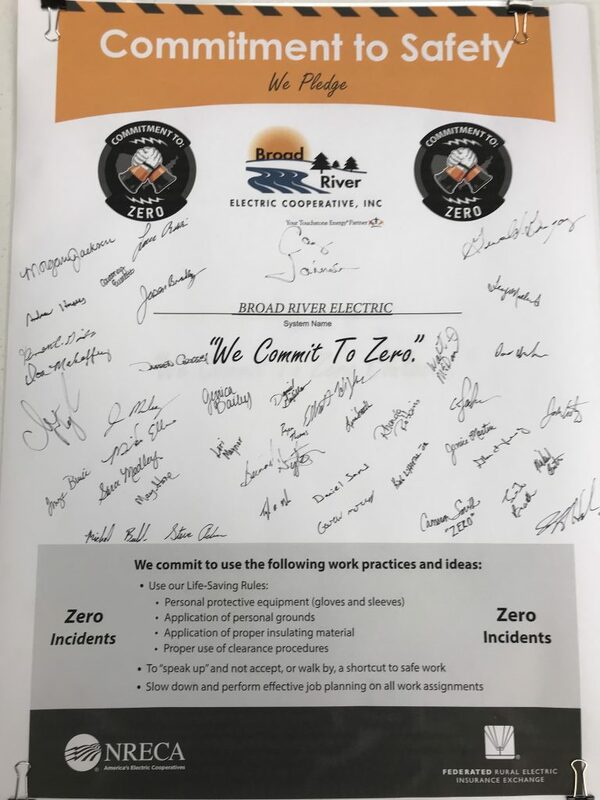 Co-op Commits to Zero Accidents - Broad River Electric Cooperative, Inc.
On Tuesday, February 12, employees of Broad River Electric doubled down on their commitment to safety, promising to do what they can to prevent accidents in the office and in the field. Commitment To: Zero is Broad River Electric Cooperative’s adaptation of a nationwide safety initiative by National Rural Electric Cooperative Association and the Federated Rural Electric Insurance Exchange. Each cooperative employee signed a pledge to follow all safety rules and regulations, to watch out for their co-workers, and to not take shortcuts from safety. Before signing their pledge, the entire staff watched “A Lineman’s Call: The Story of Jeremy White,” a short documentary about a veteran lineman at Southern Pines Electric Cooperative in Mississippi whose contact with a live power line in 2013 proved fatal. The disturbing, yet moving video serves as a cautionary tale of the importance of safety in one of the most dangerous professions there is. Broad River Electric Cooperative’s focus on safety benefits co-op employees as well as members and the general public. Aside from reducing risks and injuries, safe work practices reduce the co-op’s insurance and operating costs, helping hold down the cost of service for all members.